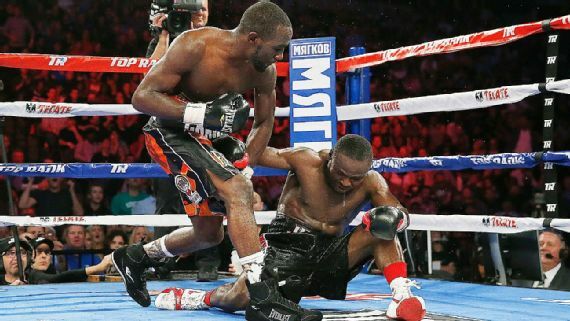 Junior welterweight titlist Terence Crawford went into his first defense against Dierry Jean on Saturday night knowing that an impressive performance would put him on top of the list to land an April 9 pay-per-view fight with superstar Manny Pacquiao in what is expected to be Pacquiao's final bout. Crawford held up his end of the bargain and will give Pacquiao and Top Rank's Bob Arum, their mutual promoter, a lot to think about. He did everything expected of him, wiping Jean out in a 10th-round knockout victory before 11,020 at the CenturyLink Center in Crawford's hometown of Omaha, Nebraska. With devout Crawford fan and Omaha native Warren Buffett in attendance, Crawford, the 2014 fighter of the year, systematically destroyed Jean, dropping him three times in a one-sided beating. After the fight, Crawford reiterated his prefight stance that he wants a shot at Pacquiao, who Arum said could either fight Crawford at welterweight or drop down to junior welterweight to challenge for Crawford's world title. "I'm ready. Bob, make it happen," he told Arum in the ring after the fight during an interview with HBO. "I'm ready. I'm gonna let my handlers, (co-managers) Cameron Dunkin and Brian McIntyre, talk to Bob Arum and Team Pacquiao, and let's see if we can make it happen." While Arum said Crawford is at the top of the list as a candidate to face Pacquiao, the two other fighters under strong consideration are England's Amir Khan, a top welterweight contender and former unified junior welterweight titleholder, and welterweight titleholder Timothy Bradley Jr., who has split two bouts with Pacquiao. Bradley was given a split decision win in their first fight, in 2012, in one of the most controversial decisions in boxing history. Pacquiao easily outpointed Bradley and got the decision in the 2014 rematch. Bradley is scheduled to fight Brandon Rios on Nov. 7 and would have to win to remain in consideration. "Manny and Terence would be a hell of a fight," Arum said. "But Manny has to make that decision who he fights for his last fight. Manny has to look at the tape first, and we have to see what the result of Nov. 7 is, and then we'll take a look after that." If Pacquiao (57-6-2, 38 KOs) elects to fight Crawford (27-0, 19 KOs) it could be something of a passing-of-the-torch fight, with Pacquiao, 36, preparing to retire to a life of politics in the Philippines and Crawford, who turned 28 last month, still very much on the ascent. But before he could seriously think about Pacquiao, the only fighter in boxing history to win world titles in eight weight classes, Crawford had to take care of Jean, a 33-year-old native of Haiti fighting out of Montreal. He did so in impressive fashion. Jean's only previous loss was a competitive decision to then-junior welterweight titlist Lamont Peterson in his hometown of Washington, D.C., in January 2014. Jean followed by dropping to lightweight and winning four fights in a row. But when he called Crawford out and surprisingly got the fight, Jean moved back up in weight and accepted the bout. What he got was a beatdown of a lifetime. Although Jean landed a few hard right hands here and there, he never got going, and Crawford took him apart, scoring the first knockdown after he turned southpaw and landed a short right hook just before the bell ended the first round. Crawford, who is very adept at switching stances, seemingly had Jean confused when he turned southpaw and continued to hurt him with right hooks in the second round. Another right hand rocked Jean in the fourth round and forced him to grab onto Crawford. Crawford, a former lightweight titleholder who moved up in weight and knocked out Thomas Dulorme to win a vacant junior welterweight title on April 18, opened a cut over Jean's right eye in the fifth round. Jean (29-2, 20 KOs) landed two good overhand rights in the eighth round that seemed to aggravate Crawford, who responded by picking up the pace as they traded toe-to-toe. "All during the promotion Dierry said he had a lot power, but he really didn't," Crawford said. "He did hit me hard once or twice, but I did what my mother once said if you get hit -- hit back." Crawford, seemingly intent on getting a knockout, came after Jean hard in the ninth round and dropped him with two left hands as the round was coming to an end. In the 10th round, Crawford continued to pound Jean, who was dedicating the fight to his older brother, Reginald, who died during training camp. When he nailed Jean with a right hand and a left, Jean went down along the ropes, and referee Tony Weeks stepped in to wave off the fight without a count at 2 minutes, 30 seconds, sending the pro-Crawford crowd into bedlam. "I just want to go in and put on a great show. He called me out twice. Did you get what you were looking for?" Crawford shouted in the direction of Jean and his manager, Camille Estephan, while still in the ring after the bout. "His manager guaranteed he'd walk away to Canada with my belt‎ from my hometown, and I felt that was disrespectful. I take things personal. "Anybody that's here can tell you where I started from, and that's from the bottom, in the streets, getting shot, working my way up in the rankings to now." Crawford connected with 169 of 533 punches (32 percent), according to CompuBox punch statistics. Jean landed 51 of 340 (15 percent). Jean was one of Pacquiao's sparring partners as Pacquiao prepared to fight Floyd Mayweather in their May 2 megafight and offered his view of a possible Pacquiao-Crawford match. "Manny is faster and hits harder," Jean said. That's OK with Crawford, who just wants his chance to prove himself against a legend. "Just watch it and see," Crawford said of the potential fight. "I'm ready for Pacquiao. All I need is a phone call."